LONDON, United Kingdom — Healthy recipe box provider Mindful Chef has partnered with Deliveroo in London to promote a new range of frozen meals that tap into the growing trend for convenient meal solutions. The collaboration, which runs until 16th April will enable Deliveroo users to order from a range of meals priced at £7. From May, the frozen meals such as spicy Panang chicken curry, Italian-style beef and squash ‘lasagne’, creamy coconut fish pie and pulled barbecue jackfruit, will be available to order directly from Mindful Chef’s website. Each meal will contain high-quality ingredients such as 100% grass-fed beef, free-range chicken and fresh fish, and will be free from refined carbs, gluten and dairy and contain no additives or refined sugars. Speaking about the partnership, Tim Lee, CEO of Mindful Chef explained: “Today’s consumers are more time-poor than ever and are increasingly conscious about regularly eating healthy food. 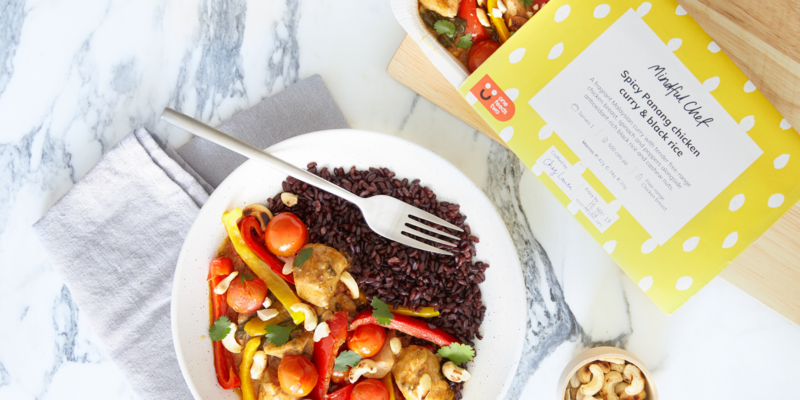 Mindful Chef’s new frozen meals remain healthy like our recipe box service and will give customers convenient and nutritious options to fit their lifestyles. Launched in 2015, Mindful Chef has enjoyed rapid growth – including a 178% surge in sales in the past year alone. But with sales growth slowing sector-wide, in order to survive in the long term, the brand recognises the need to continue adapting its model. To support its future strategy, earlier this year the company secured £6m in funding from British investment firm Piper. The cash injection will be used to continue expanding its customer base in the UK, as well as helping it capitalise on the rapid growth of the recipe box market, which is forecast to double over the next 10 years. Its partnership with Deliveroo highlights just how intent it is on reaching a more mainstream audience — the number of Deliveroo customers in the UK currently sits at around 6 million, across 100 towns and cities. For Deliveroo meanwhile, the collaboration presents the six-year-old brand with an opportunity to dip its toe even further into the wellness space and the potential to differentiate itself from its rivals — a strategy it appears to be doubling down on. Earlier this year, the company launched a campaign for #FeelGoodFood backed by British Nutritionist Rhiannon Lambert, a social media influencer boasting over 100k followers on Instagram, which aims to highlight the healthy options currently available to consumers. In addition, the company has also been working with restaurant partners to develop healthy dishes, as well as launching an initiative that enables restaurants to display dish-by-dish calorie information on its delivery platform. “Deliveroo’s outlook is simple: the way to eat healthily is by having more information and more selection,” commented Will Shu, Founder of Deliveroo, at the time of the announcement. In doing so, the brand hopes it can capture the loyalty of health-conscious consumers that may look elsewhere if they are forced to sacrifice taste for nutrition.